Guardians chair Ben Knight, a news cameraman, and Ben’s daughter Joy (back)at the webcam site. 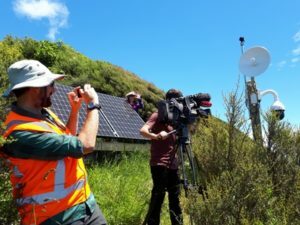 Kāpiti’s Marine Reserve is now being monitored 24/7 by a high-tech web camera that provides a live feed of any illegal activities. 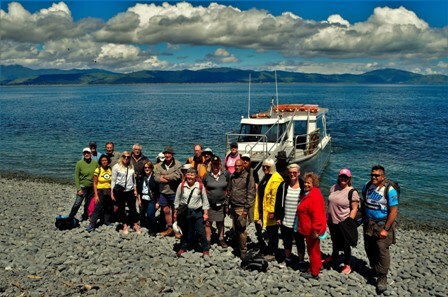 This week marks the formal launch of the camera, an initiative of volunteer community group Guardians of Kāpiti Marine Reserve (the Guardians). It was installed by the Guardians with assistance from the Department of Conservation. The camera technology was funded by the Embassy of the United States of America. Guardians chair Ben Knight says the collaboration has enabled a cutting-edge tool to be deployed to protect one of New Zealand’s largest and oldest marine reserves, rated by DOC as one of the top 10 marine biodiversity hot spots. “Kāpiti marine reserve is the hidden jewel in the Kāpiti Island crown and is a nationally significant marine taonga,” he says. “The reserve is host to an incredible array of indigenous marine life and continues to play an important role in rebuilding the heavily depleted fish stocks outside of the protected area through spillover of mature fish and fish larvae. “It provides important benefits to recreational, commercial and customary fishers. “It is therefore vitally important that this national treasure is properly protected so that current and future generations can enjoy the benefits it provides. Guests gathered on the beach at the island to celebrate the opening of a new era in protecting the marine reserve. “The webcam project is a scalable, high-tech solution to the age-old problem of illegal fishing. We believe it will act as a serious deterrent to poachers and will enable a more targeted approach taken to the compliance and law enforcement effort. Ben Knight says during the past 6-month testing phase, the camera has already been widely used by local boaties and divers to check conditions before they head out for a day on the water. “It’s an awesome multi-tool with many benefits to the local community and the Guardians are proud to have led the development of the project,” he says. Installed at the north end of the island, the camera overlooks the ‘Hole in the Rock’. This popular site is hard to view from the mainland or DOC’s island base. It will increase DOC’s ability to gather evidence of any suspected poaching. DOC’s Kāpiti Wellington operations manager Jack Mace says it will be a great tool for deterring and identifying potential offenders. “It’s exciting for our rangers – it provides an extremely high-quality picture. We can read the brand name on your sunglasses. Jack Mace says this is due to the very good work the Guardians have done in raising the profile of the reserve with locals and in the media. At this week’s launch, further US Embassy funding of $10,600 was announced for two more web cameras aimed at the southern parts of the marine reserve. The U.S. Embassy’s Deputy Chief of Mission, Susan Niblock, says the Embassy welcomes efforts in the Pacific region to enhance information sharing on security and law enforcement concerns to combat illegal, unreported and unregulated fishing.